Three years ago, I was moderately convinced that question would be one of those timeless statements. Kind of like, “Where were you when JFK got shot” for the generation before mine, or “Did you get to see One Direction in person” for the generation of muppets that came after me, the “Obama” question seemed like a pivotal moment. After all, here was a man elected on an amazing platform of platitudes. Words like hope, change, freedom, fairness, etc were draped around Obama’s shoulders like Superman’s red cape. Heck, I half expected Obama, during his inauguration, to rip open his shirt and reveal a magnificent S.
Alas, the past three years have proven a few things, but few more comprehensively than the fact that Obama was elected with impossible expectations and has proven to be, pretty much, just another politician. Now Americans are faced with a choice between a religious Mormon private-equity magnate from Massachusetts, and a Hawaiian-born, Indonesian-raised, Harvard-educated, Chicago dwelling lawyer. And, before the campaign has even officially begun, the gloves are off. In a far cry from the hails of hope emanating from some Obama proponents, the Obama twitter feed let off a cluster bomb of negative tweets yesterday (see below). Yes, it seems the ‘change you can believe in’ and ‘hope for America’ slogans have been discarded in favour of ‘Romney is a loser’ and ‘don’t vote for him’ ones instead. 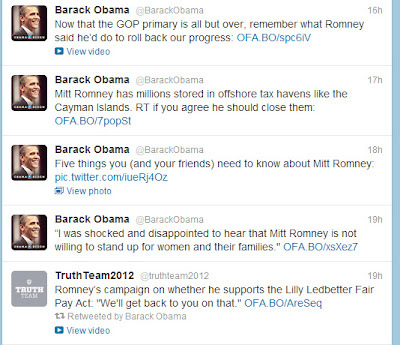 Maybe this is because Obama knows Romney has good form when it comes to negative campaigns. For example, a few months back, Romney and New Gingrich were locked in a pretty close battle for the nomination, until Romney spent a-couple-of-million dollars on negative TV ads against Newt. Gingrich had nothing to come back with and was promptly overrun and outcast from the nomination race. So this seems to be what we’re in for – around six months of playing the man not the ball. Emphasising why you shouldn’t vote for the other guy rather than extolling the virtues of a particular candidate. Initially though, I have to give the negative-honour award to Romney. 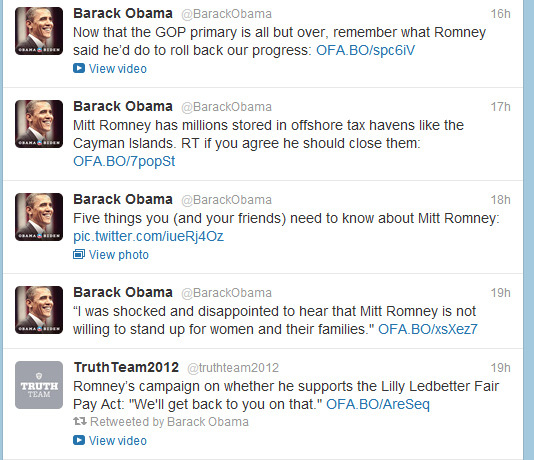 You see, the majority of negative mud-slinging the Obama camp has been throwing at Romney is that he’s too rich. That he doesn’t pay enough taxes. That he earns too much money. Yes, that’s hardly the sort of progressive campaigning one would hope for from the ‘hope’ candidate. Romney, on the other hand, has unleashed a barrage of attacks on Obama’s policies. Claiming the President is responsible for high unemployment, a stumbling economy, so-called ‘failed’ energy policies etc. Nothing about Obama as a person – all about his policy short-comings. If the best Obama can muster is a prolonged campaign claiming Romney makes too much money, I really don’t like his chances in November. At the moment the public see Romney as a bit aloof and wooden. But, if the economy refuses to recover, and gas prices escalate exponentially, people may well start to see Romney as a sort of financial-mr-fix-it. If they think the economy is broken, and Obama has failed to fix it, they’ll call in some hired help. And Romney has a long track record of turning around failed financial ventures. So, while Obama may continue to be massively popular overseas, the home battle may be a quite different story. And he find himself the most popular one term president since… well… someone. There won't be a voting booth near me. Yeah, who better to fix a once-promising-but-now-broke-and-broken entity than someone who made a living from doing just that. I'd much rather the community activist guy give it a go.